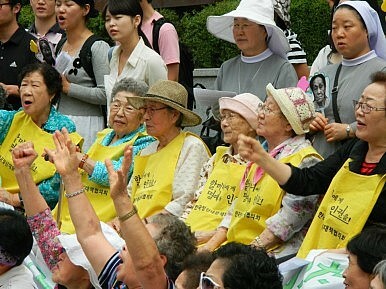 Image Credit: "Comfort Women" rally in front of Japanese Embassy in Seoul, Aug 2011, via Wikimedia Commons. Japan’s record on social and gender equality, as well as its wartime past, took quite a hit this week as several international bodies formally chastised Tokyo. While the issues presented are certainly not new for Japan, these organizations highlighted Japan’s current position on topics that are considered crucial to many of its neighbors. However, not all the news was negative, and with respect to the current administration’s attempt to increase the role of women in politics and leadership positions in general, there is the expectation that Japan has found the right path forward. A U.N. Human Rights Committee report released on Thursday was highly critical of Japan on several fronts. Though the report did commend Japan on its legislation to combat human trafficking and improve gender equality, it cited two main areas where Japan had fallen behind, and that are of particular concern to countries like China, the Philippines, and North and South Korea. The report noted “concern at the widespread racist discourse” as well as hate speech directed at minorities living in Japan, the continued presence of “Japanese only” signs, as well as “insufficient protection” in penal and civil law for those targeted by racist acts. The report also recommended that Japan make a more open and explicit apology in order to take responsibility for its use of “comfort women” during the Second World War, and change the current policy of ignoring or even revising this issue in public education and text books. The International Crisis Group was also critical of Japan in its Asia Report on Thursday. It noted the highly inflammatory nature of Prime Minister Shinzo Abe’s visit to Yasukuni Shrine, where 14 Japanese Class A war criminals are enshrined, and recommended that the government give assurance that such a visit not happen again while Abe is prime minister. The report can be considered somewhat timely as the anniversary of the Japanese defeat in the Second World War is on August 15, a time when many Japanese politicians visit the shrine. However, the report also noted China’s contribution to regional tensions, specifically its repeated use of anti-Japanese rhetoric and its antagonistic deployment of aircraft and coast guard vessels near the disputed Senkaku/Diaoyu Islands. While at least the current administration has concrete plans and goals to address the challenges of gender inequality, the other problems are more systemic and require a much greater effort by the government. The Diet is not considering the laws that would need to be adopted to eliminate racial discrimination, and the rules that are in place are not uniformly enforced. As for Japan’s wartime past, the review of the 1994 Kono Statement last month that apologized for its use of “comfort women” was disconcerting for Japan’s neighbors. And while Abe has yet to revisit Yasukuni since last December, his push this summer to reinterpret Japan’s right to collective self-defense is a much more telling strategy. In 1998, Japan and South Korea agreed to “build a future-oriented relationship based on reconciliation.” What went wrong? Abe Will Go to PyeongChang, Despite Japan-South Korea TensionsBritain’s Approach to Japan and East AsiaJapan and China: 'Intimate Rivals'Yomiuri Shimbun Apologizes on Comfort Women IssueWill U.S. Midterms Become Justification for Japanese Defense?